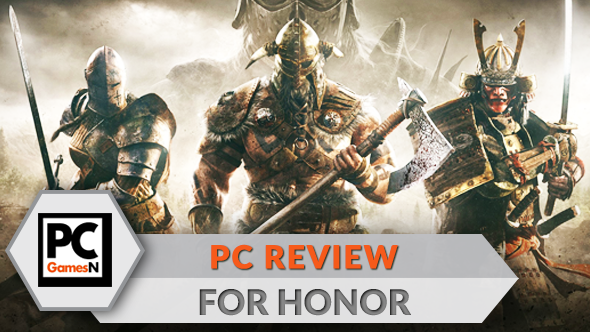 A Viking, a knight and a samurai walk into a bar, and the bartender says, “This must be PCGamesN’s For Honor review and I’m merely part of a poorly thought out joke that isn’t really going anywhere. This isn’t living.” Anyway, welcome to our For Honor review. Learn the ropes of this intricate medieval brawler with our For Honor class guide. Ubisoft Montreal’s latest game is a boisterous action romp pitting three warring factions against each other in a millennium-long war. It’s a weird combination of post-apocalyptic fantasy and medieval combat but is mostly just an excuse to get a bunch of badass warriors to stick axes and spears in each other. A worthy goal. But how’s the execution? Well, allow me to take you right onto the battlefield: My ragged breathing matches that of the hulking Viking I’m controlling. It’s been a long fight, and we’re both starting to get tired. His stamina meter recharges, and a burst of adrenaline breaths new life into the two of us. It’s now or never. I charge at my opponent and catch her off guard, pushing her back and making her head spin. My axe cuts into her side, the start of a combo that leaves her close to death. Unfortunately she quickly recovers and blocks the next blow, and the second, and then she parries the third and now I’m losing control of the fight. The next few minutes see us dance around each other, poking and prodding, looking for an opening. We both know that only a couple of well-timed heavy attacks will end the fight, with one of us lying in the mud, caked in blood. She swipes left, I dodge and roll and now I’m behind her. Finally. The axe leaves a massive gash on her helmet, sanguine fluid leaking out of it. My last strike is an execution, separating head from neck. It’s one-minute past midnight on Valentine’s Day, and I’m totally in love with For Honor’s combat system. Fighting is this fantastic mashup of the first-person melee brawls from games like Chivalry: Medieval Warfare and War of the Vikings, and pure fighting games like Soulcalibur. You’ve got all the directional and positional stuff from the sword-swinging action games – so you’re choosing the direction you’re blocking and striking in – but you’ve also got to worry about stuns, throws, cancelling moves and all the lovely technical stuff that comes with a competitive fighter. 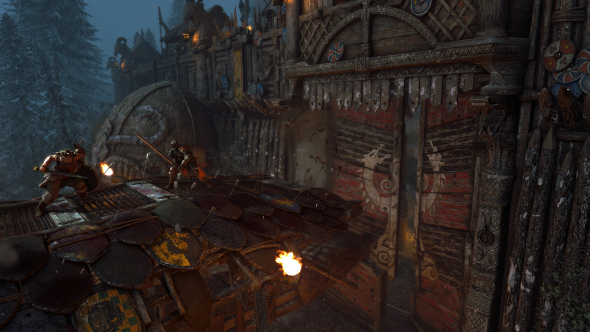 It’s a bit of a surprise, since For Honor looks a lot like a straightforward action game. Play it like one, however, and you’re going to spend most of your time absent your head. Get used to being decapitated. One-on-one duels are where the game shines. Oh my, how it shines. Sometimes literally, when your samurai’s impossibly polished blade reflects the light of the sun and hypnotises you. I honestly can’t think of another game where melee combat is this satisfying. When you lock onto an opponent, you enter duel mode, which means you move more slowly, more deliberately, and you can see an unobtrusive overlay that reveals which of the three directions your weapon – and your opponent’s – is resting in. It’s white in the neutral stance, red during an attack, and flashing red to indicate the right time to parry or dodge out of the way. This is the foundation of combat: striking in the direction that your foe isn’t defending and blocking in the direction of that angry red indicator. Is that pesky Viking guarding his left side? Go for a high attack, slicing at his vulnerable head. I’m making it sound simple, but it isn’t. Here’s the first wrinkle: blocking is fast and easy. You can switch the direction of your weapon or shield instantly, while initial attacks in a combo can take a moment to connect. So you’re frequently going to watch as your sword bounces off another sword, only chipping away at your foe’s health meter. This is why you’ve got a guard break ability, so you can smash an opponent’s defences and quickly follow it up with a brutal attack. But you don’t need to. You can, instead, hit the guard break button again and knock your foe back, creating some breaking room. Or, with the right hero, you can ram them a fair distance, perhaps off a cliff, into some water or fire, or maybe even onto a wall of spikes. 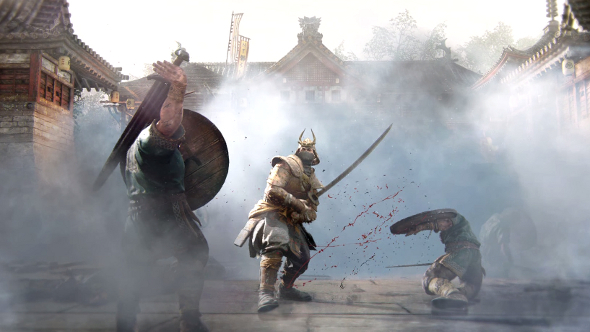 For Honor is absolutely bursting with options, and each class of hero – there are four, each with three heroes – comes with their own mechanics, while individual heroes have unique combos and special hooks that make them feel distinct. Some are strengths, and some are limitations. Shield-bearing heroes, for instance, can go into a defensive posture that allows them to block in all directions. The assassins, meanwhile, can only keep their block up for a few seconds, and so much react quickly. It’s a brutal game, but it’s also tactical. You can be very, very sneaky. I’m not talking about stealth, but rather traps and feints. Poison mines, smoke bombs, fire bombs – there are many ways to take out a foe or disorientate them without using your weapon. And you can make an enemy misjudge your intentions by attacking, quickly cancelling the move, and then striking from another direction. Feats like the aforementioned mines are also accompanied by buffs and heals that can give you a brief edge or save your life just as it’s flashing before your eyes. I’m in two minds about these. They don’t really sit comfortably next to the skill-based elements, but they do prolong the excellent duels. I certainly prefer them to the aforementioned wall spikes and fatal dives off cliffs. The ability to instantly kill an enemy just by pushing them into or off something just seems cheap, and it’s considerably easier to push someone than it is to deflect a push. 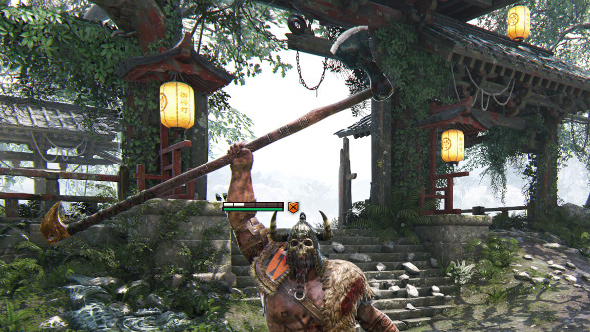 It would be easy to write off For Honor as a bit sluggish. You are, after all, controlling very large men and women wielding very large tools of death. Every hero aside from the three assassins can feel a little slow, and attacks can take a moment to wind up. Really, though, fights are all about momentum. While the first strike might be a lumbering blow, it can be followed up quickly, and heroes can fire off combo after combo with surprising speed. And it’s important to note that health can be carved off rapidly, so a fight can last only a matter of seconds if you’re not careful. It’s a real shame that For Honor’s exceptional combat is stuck within what is otherwise a fairly unimaginative and humdrum package. The meat is the multiplayer faction war, but first let’s take a look at the campaign. 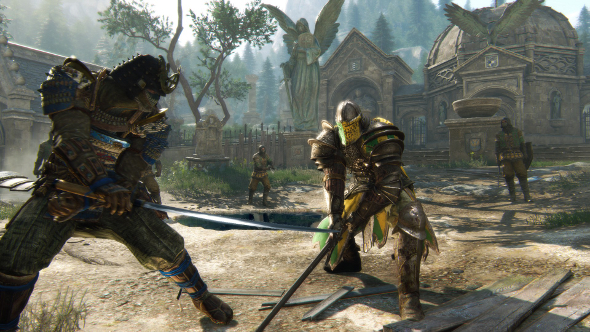 Ubisoft Montreal boasted that For Honor would contain a full-featured single-player mode that would justify a purchase even if you weren’t interested in the multiplayer. This is utter nonsense. It’s essentially a five to six hour tutorial teaching you how to play some, but not all, of the heroes available online. The campaign is split up into three chapters, one for each faction, each containing six very brief missions. Every mission is a bit different, objective-wise, and there’s the occasional striking set piece, like a fortress siege or duking it out on top off a massive battering ram, but most of the time you’ll just be slaughtering random soldiers who die in a single hit. Enemy and ally AI is atrocious – allies in particular are serious dangers as they’ll happily swipe at you instead of a foe – and aside from a few standout duels, the missions are just violent slogs. For Honor’s story doesn’t fare any better. While the factions are all historical warriors, the setting is a post-apocalyptic fantasy world where a war has been going on for 1,000 years. There’s a woman with an obsession with wolves – she won’t shut up about them – and Darwinism, and she’s trying to keep the war going. You’re kind of (but not really) trying to stop her. There’s not much more to it than that. It feels like half of the story is missing, and I’m still completely baffled by the closing cutscene which seems to be setting something up… but I have no idea what. It reeks of being slapped onto the game in a hurry. So ignore Ubisoft – this is a multiplayer game through and through. Not that this is a bad thing! 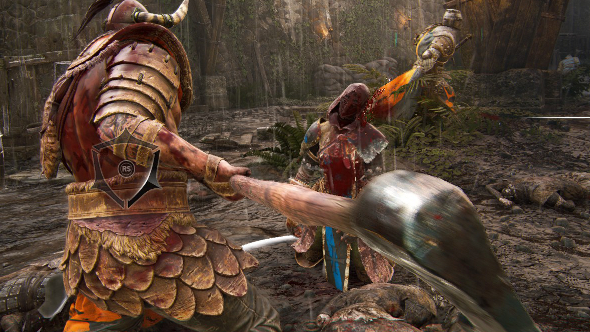 Fighting other humans is at the very heart of games like For Honor; it’s where they reach their greatest heights. 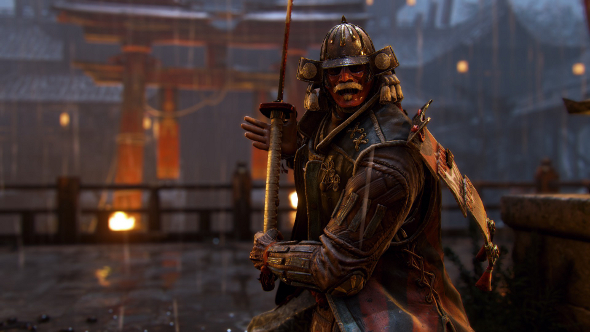 There are a whole bunch of modes and a weird meta-game faction war thing going on, but the only one you should really care about is the one-on-one duels, especially since your faction makes little difference and you can play with whatever heroes you want. Two warriors, facing off against each other, with victory generally going to the better player. There’s nothing but the fight and your opponent to worry about. I love these duels, even when I lose miserably. I’ve been beaten up by the preternaturally gifted – I have no clue how they got so good so quickly – and I never lose my smile. It’s like watching an amazing dance routine, and brawling with a really skilled foe highlights the depth of the combat system. There’s always more to learn. It’s when For Honor adds more fluff that things take a downward turn. Elimination, which pits two teams of four against each other, can be fun, since it initially spawns everyone facing an enemy, immediately forcing you into duels. But all it takes is for one person to run off and hunt down someone already in a fight for it all to fall apart. Some characters are pretty good at giving chase, but even then, it’s no fun. That said, fighting multiple opponents can be a lark, and the two-on-two brawl mode is almost as much fun as the aforementioned duels. External blocking means that you can defend yourself against additional foes even while locked onto someone else, and a Revenge meter can be built up, transforming you, briefly, into a superhuman capable of taking on a whole group – but you’ve got to be quick. Ultimately, though, if you’re fighting more than two people, chances are that you’re going to die, and it’s got nothing to do with skill. Lamentably, ganging up on people has become a basic tactic in the boring Deathmatch skirmishes, and even more so in Dominion. 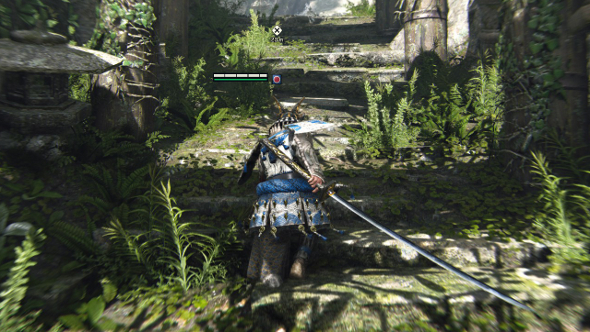 The latter is the strangest part of For Honor, and it absolutely doesn’t belong in a fighting game. It’s a half-baked mix between a MOBA and a capture and hold game, tasking teams with generating 1000 points and then killing all their enemies before they can claim the capture points for themselves. There are also pointless NPC minions fighting over the central point. Winning comes down to communication, but just sticking together and hunting down stragglers works too. Dominion is also the only mode that takes into account the stats of your gear, reducing the importance of skill even more. It comes down to how much steel – the game’s currency – you have to spend, and since you can also use real money to get more steel, it rewards people for spending actual cash. 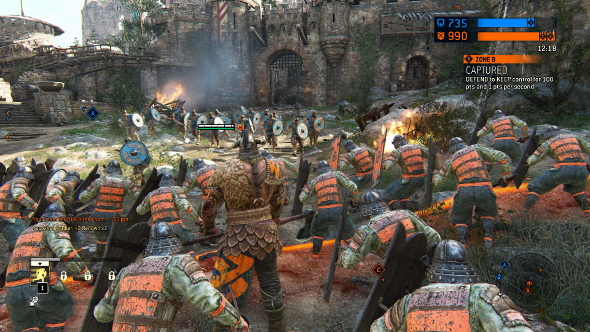 It feels like the antithesis of the honourable duels that make For Honor stand out. You can, at least, get steel just from playing, and spend it on gear, cosmetics and unlocking new heroes. It’s not made very clear by the game, but you can play every hero right from the start. It’s only for customisation that you need to pay their steel price. I don’t want to be too much of a downer when it comes to the gear system, however, because on the aesthetic side of things it’s very strong. For Honor is a great looking game, and with the diverse selection of unlockable paints, patterns, ornaments, weapons and armour, you can make some really impressive, intimidating medieval brawlers. It’s a great incentive to keep the war going, and once you start ignoring the stats, it becomes a delightful game of dressing up burly men and women. Matchmaking seems to have improved since the last open beta, but it’s still got a long way to go before it actually works. Even at peak times, expect to see a lot of bots in your games, and I don’t get the impression that the system makes any attempt to create balanced teams. It’s just a mess. You’ll probably have the best time grouping up rather than attempting to use matchmaking, at least until it’s fixed. For Honor could have been so much better, and its combat deserves to have a much stronger campaign and multiplayer. But that combat is so good – and fighting is what you’ll be doing 90 percent of the time – that it makes up for a lot of the game’s failings. It’s a testament to its quality that I’m still smitten, and have every intention of continuing to lead my Viking clan to glory. Stick to the duels and the two-versus-two brawls, and you’ll be in Valhalla.